Short walking distances, well designed work areas, lightweight clusters and automation options, all improve milking workload and worker satisfaction. 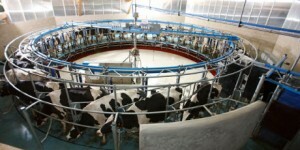 Cows are well positioned close to the milker, with good udder access and a good view to check cow health status. One milker can control a whole system with up to 28 milking points, but it is easy to accommodate more milkers for large herds. Turning speed is controlled by the rotary controller, in combination with ALPRO™ herd management system. It analyses data and adjusts rotation speed to that of the slowest milking cow currently on the platform, to provide time for milk out. Cow traffic is calm and always moving forward. The unique sequence gate design for fast-moving cow traffic provides space for wide walkways onto the platform with no obstacles. Entry is so easy that even new cows learn quickly how to do it. It has an optional extra gate for calm cows at the exit. These range from pure cluster take off to full ALPRO™ connection. Naturally safety, efficiency, low power consumption, noise control and durability are built in. DeLaval HBR has such high potential throughout, it can adapt to larger herds with a moderate increase in time spent on milking. This rotary is sized from 16 to 40 stalls.